How to Save Over $26 Per Month in Lighting Costs. Artificial lighting is a large contributor to the world’s greenhouse gas emissions and according to Natural Resources Canada (NRCan), it constitutes up to 4% of the total primary energy used in residential buildings. Advancements in energy-efficient lighting have made it possible to use light bulbs and fixtures that not only help in cutting energy costs but are also more environment friendly. Energy-efficient lighting involves moving away from the use of traditional incandescent bulbs towards the use of LED (light emitting diode) or CFLs (compact fluorescent lamps) lighting. LED bulbs and CFLs have longer life spans than incandescent bulbs and hence offer savings in the replacement costs. A comparison in annual energy cost of these three types of bulbs having same lighting property (800 lumens) is shown below. It is seen that energy costs for incandescent bulbs are about 6 times higher than LED energy costs. CFLs also provide savings in energy use compared to incandescent bulbs, but consist of toxic element mercury which makes their disposal a difficult problem. Efforts are being taken in different provinces of Canada to tackle disposal of different lights and fixtures. A provincial disposal program (https://www.lightrecycle.ca/) is also active in British Columbia, which serves to reduce negative environment impact of various lighting system components. This program has a number of drop-off points in all communities of British Columbia and 6 in Kelowna. LED lights are a better option compared to incandescent and CFLs, as they provide more energy saving and better environmental performance. However, the initial investment costs of LED are still high and act as a hurdle to their widespread adoption in the residential sector. Recent advancements in lighting technologies are bringing down the prices of LED bulbs along with offering greater variety in choice of light colors, illuminance level, bulb shapes and sizes. Furthermore, smart LED light bulbs that offer greater savings on energy costs and ensure shorter payback periods. To encourage the use of LED, financial incentives are offered by local utility companies. For residents of British Columbia, instant in-store rebates of up to 20 CAD$ are currently being offered for select ENERGY STAR® certified LED bulbs, fixtures and qualifying lighting controls through retailers working with FortisBC in South Okanagan and the Kootenay’s, and BC Hydro elsewhere in the province. For the Wilden Living Lab, two types of lights were tested. Incandescent bulbs were used in “Home of Today” while LED lights were used in “Home of Tomorrow”. When energy use was calculated through pre-established formulas it showed that on average H2D lighting energy use (224.9 kWh/month) should be 6.24 times higher than H2M (36 kWh/month) if usage patterns remain exactly the same throughout the month. 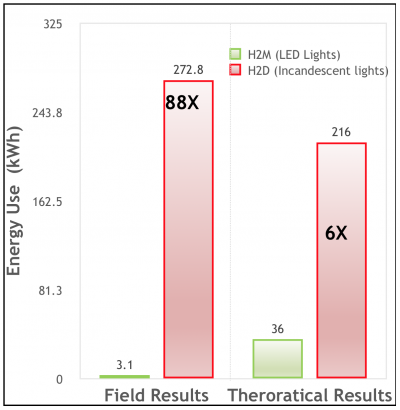 These theoretical results in energy savings reinforce the case of use of LED in all residential buildings. The variation in current (Ampere/second) for the lighting in the two homes, were monitored to evaluate energy usage over the month of October, 2017. The variation in current usage by two types of lights over a three days period (Oct 5-Oct 7, 2018) is shown in the figure below. Field monitored data for the whole month of October 2017 showed that H2M used only 3.1 kWh of energy while H2D used 273.1 kWh (Approximately 88 times higher than the H2M). 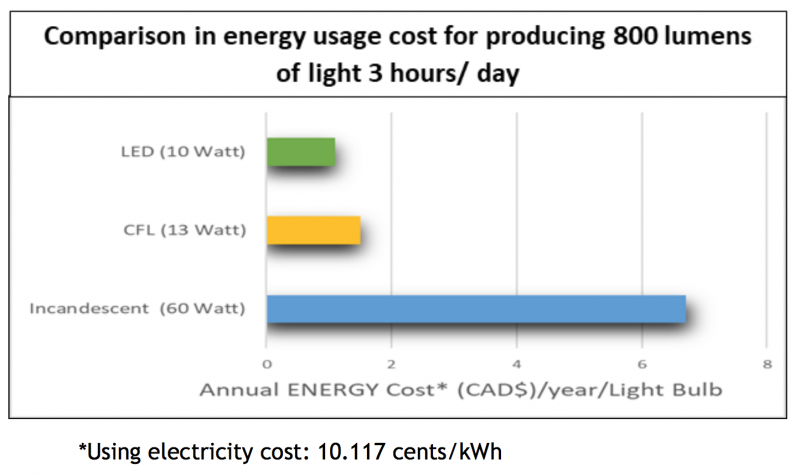 Hence, the lighting cost for H2M for one month came to be $0.31 CAD$, while for H2D it was $27.63 CAD$. Why this huge difference in expected and monitored results? Occupants of H2M are practicing efficient occupant behaviour by turning-off lights when not in use. Occupants in H2M are making more use of natural lighting and depending less on artificial lighting. Occupant of H2M are spending less time at home as compared to those in H2D. Further study on occupant’s behaviour patterns that form part of Wilden Living Lab project will be able to determine the reason behind this variation in theoretically expected and actual observed data. Stay posted for more real life data results in the future. In next month’s issue, we will talk about results on energy efficient windows in UBC Okanagan’s Facility Lab.